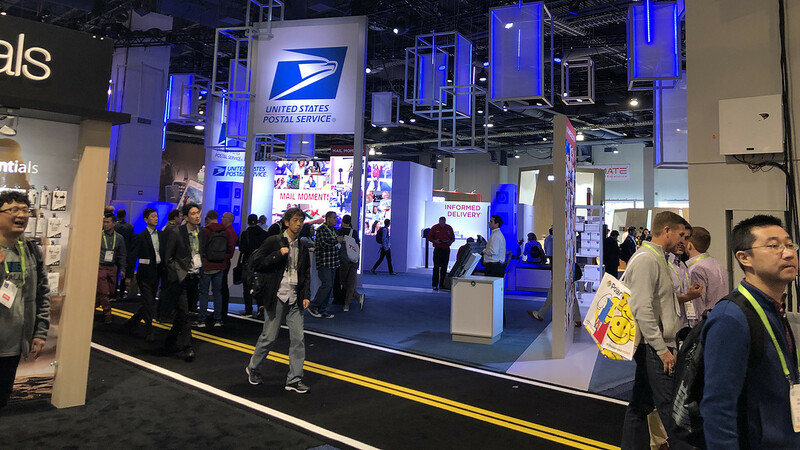 Why was the US postal service at CES? Home https://server7.kproxy.com/servlet/redirect.srv/sruj/smyrwpoii/p2/ Business https://server7.kproxy.com/servlet/redirect.srv/sruj/smyrwpoii/p2/ Why was the US postal service at CES? When the US government's shutdown was becoming the longest post, and many employees missed their pay slips on Friday, US postal workers were working around a conference center in Las Vegas, heading for a smart mailbox. Posthouse has been exhibiting at CES, the largest annual tech conference for nearly two decades, including in the 2019 show, where the national postal operator showed his "Informed Delivery" system, an online service and an app that allows registered users see grayscale images of incoming letters before they are delivered to their mailboxes. The Agency also showed a "connected home mailbox" that could provide "capacity alerts" and delivery messages. USPS showed a smart mailbox on this year's CES. An announcer talking on a microphone encouraged visitors to stop at the booth and check out the smart mailbox that "turns the conventional home mailbox into a smart device" and represents "the future of mail delivery." She told business members that they could come past and learn more about ways to reach their customers. The post office is exhibited in a large booth with large digital displays and a joystick-enabled game that allows users to navigate a labyrinth of virtual packages and try to accumulate most before the time expires. USPS is not an arm in the federal government, so it is not subject to the interruption, even if it is monitored by federal and civil servants. It is also subject to the Freedom of Information Act, and MarketWatch has obtained more than 600 pages of documentation regarding the agency's 2018 visit to CES through the law. USPS sent more than 70 employees to CES in 2018 at a cost of nearly $ 200,000 according to MarketWatch calculations based on documents obtained through a request for freedom to the information law. These employees ranged from sales and marketing staff to those who focused on information technology support and the Informed Delivery product. Not included in the FOIA records received by MarketWatch were figures relating to how much the Agency used for the construction and design of its booth, nor how much it paid to the consumer technology association running CES show. The cost varies greatly from the cabinet to the CES, and CTA did not return a MarketWatch request for comment on the USPS paid this year for its cabin or the price of a similarly large room in South Hall. The amount that USPS pays to exhibit at the conference is multiplied several times at the end of the year as the agency heads for several events. A 2017 post on the USPS website says the agency attends about 60 fairs and estimates an investment return of "about 4,000 percent" for the overall fairs effort. A spokeswoman from the agency refused to comment on the expected return on CES specifically or the amount of money spent on the Agency's presence on this year's CES. "We participate in fairs to promote our shipping options in the fast-growing e-commerce market and promote our direct mail services on the highly competitive advertising market," she said, adding that the agency has "a long and proud history of innovation." Post Office experienced a turnover of 1.5% in the financial year ending September last year, to 70, $ 6 billion, although the agency's losses fluctuated by 43%: USPS reported a net run of $ 3.9 billion for the financial year. The controllable loss that excludes pension and compensation related expenses expanded to $ 1.9 billion from $ 814 million the year before. The Agency refused to comment on its annual marketing budget. The Post Office's "Informed Delivery" service allows users to view images of envelopes that will be delivered to their mailboxes. According to the documents, it appears that USPS had a Chicago-based marketing company called Czarnowski Display Service Inc. to assist with the exhibition in Las Vegas. The post office did not release the contract in the FOIA records for the 2018 show, and MarketWatch could not find a dollar figure in the documents. The records did not include the cost of the post office fair, but indicated that it was about 80 feet by 50 feet in size. Czarnowski Display lists its 2015 work for USPS on CES as a "case study" on its website and notes that the exhibition that year was named by FindTheBest.com in an article titled: "The 20 Most Eyes-Catching Booths on CES 2015. "This booth included a" package memory game ", according to the case study. Upon request, Czarnowski referred MarketWatch to the post office communication team.